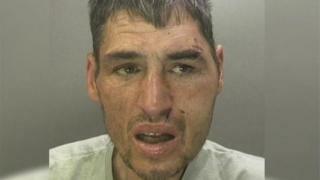 An "out of control" burglar caused terror and upset for his victims, police have said. Nicholas Mason was found guilty of several counts of burglary after raiding 22 homes across Birmingham and Wolverhampton last year. The 44-year-old was cleared of causing an 86-year-old woman to suffer a broken bone in her neck at her home. Police described Mason as "out of control". He was jailed for ten years at Birmingham Crown Court. He also stole cars and used stolen bank cards to fraudulently buy items from shops. He was arrested on 8 June last year, after being hit on the head by a Wolverhampton homeowner who found Mason in his garden with a laptop and phone. He was found not guilty of six counts of burglary, one count of theft of a motor vehicle, one count of robbery, and one count of causing grievous bodily harm with intent. Det Con Alan Reeves said he had shown no regard for the terror and upset he caused. "There has not been a shred of remorse or acceptance of responsibility for his actions throughout the proceedings," he said.